I needed a scooter that could easily go 45-55 MPH for my commute to work. I looked at a number of scooters, and bought the E-ton Matrix 150 scooter. I have been riding it now for 5 months, and it is great! It has lots of power (150 cc engine), and will easily go 55-60 MPH, yet I am averaging around 75 MPG. It has front and rear hydraulic disk brakes which are excellent. It feels very solid and easily maneuverable, and is very comfortable to ride- I have a ten mile commute each way, and have been riding rain or shine. It has a decent amount of under-seat storage- you can get a full-face helmet in, but not with much else. It is a little finicky to start in cold weather- it has a manual choke, but I have gotten the hang of it now, and have no problems with it. Reliability has been great so far- no problems after just over 1000 miles. This scooter has more leg room (I am 6'2"), yet was quite a bit cheaper than some comparable models, and I highly recommend it! I think that high quality written update about E-Ton Matrix R4-150 Scooter Review, that will guide you properly. Just type best essay writing service bestessayservicereviews.com in Google search bar and get a list of top quality educational websites. you remind me of a friend of mine who bought a first generation Prius- he would do everything to get the maximum gas milage- like slowly coasting half a block to a red light with everyone angry and honking behind him! My Matrix also has around 4000 miles, and the last time I checked I was getting around 76 MPG. Your idea for shutting of the engine sounds good (drivers routinely do this in Europe, and my old Prius does this on its own), but I hope you don't wear out the starting motor early, which would cost a lot more than the gas! I hope the work situation improves soon. I've recently experienced significant increases in my MPG on my Matrix R4-150 scooter. First let me say, I'm an economy freak when it comes to gasoline. I hate buying the stuff. I hate paying for it. I hate the war's it causes, the pollution it causes, the funding of foreign governments, everything. I drove a Honda CRX-HF (50 mpg) for 8 years (really nice when gas was $1.50 a gallon). My Matrix has over 4,000 miles on it. It is badly in need of oil change and general servicing, but I'm between jobs at the moment and so that will have to wait. When I bought the bike at Ride-Now Chandler, Az. the sale person told me to put premium gasoline in it - which I've always have done. When I first got the bike it seemed like I got 82mpg. Later on it seemed like I got as low as 75 mpg. For the last two months, I've used only Shell's highest octane fuel. My gas mileage seemed to improve right away, but I couldn't prove it. In the mean time, I've read all about the Honda PCX 125. This is, in my mind, THE premium scooter, but it also cost twice as much as my Eton. But that bike gets 110mpg. However, it also has a stop/start feature (which it doesn't include on the PCXs that Honda sells in the U.S.). The stop start feature automatically turns the engine off when the bike is stationary for 3 seconds. As soon as you accelerate, the engine immediately comes alive. I noticed that my Matrix starts with just the slightest touch of a button. So I thought, why can't I just do the same thing on my own? A sort of manual "start/stop" function. When I get to a light, especially one that just turned yellow, I hit the kill switch. As soon as the engine dies, I put the kill switch back on. I hold the break lever down, and I hold my thumb over the start switch. As soon as the light changes, or is about the change, I tap the start switch, the bike fire's right up and I'm on my way. I also cheat in other ways. When I come into my subdivision, it's a down hill coast for 4/10ths of a mile, so I turn the engine off then too. I decided to check out Progressive's rates on-line- they do have 3 types of policies. Two of them are cheaper, but don't give much coverage, and I don't think even meet the minimum standard for Arizona. (such as not having uninsured motorist coverage) The policy equivalent to the one I have from GEICO is $339, which is slightly cheaper, but not a huge difference. I guess the rate would therefore depend on how much insurance you want. For my Genuine Buddy 125cc scooter in Idaho, I pay under $100/year for insurance from Progressive. Geico didn't come anywhere near as cheap when I got a quote back in 2007. I have my scooter insured through GEICO for $364 a year. I'm sure the rate also depends on age, driving record, location, etc. I would shop around quite a bit. I was having trouble shutting my seat, and increasingly, opening my seat, for stowing my helmet and fueling up on gas. A friend of mine looked at the latch and suggested it was too tight. He applied some sewing machine oil to the latch and now it works fantastically... perfectly. I'm quite happy. So if you are having problems with your seat latch, try putting some lubricant on it. I bought the detachable one since I store my scooter in a bike shed which is not long enough for the scooter and the luggage box. This way I detach the box when I put the scooter away. The box is not too bad, a little on the cheap side for what it cost, but it works well. The Matrix deluxe box looks nicer, and has lights that can be connected to the scooter electrical system. It is gresat to have the extra storage room! There appear to be three options for rear containers for the Matrix. The delux detachable, a middle grade one specifically designed to integrate with the Matrix and an economy model. Did you look at all three? Is the delux a better value than the middle grade ones? Would you get the delux one again? Is the detachable functionality of value? Does it work well, or do you foresee a problem with detaching? Please respond to this, even if it is a long time after I post. I am on the road right now and won't get to my bike until early September. I've put 1000 miles on mine. My experience has been the same as everyone else's here. I'm 6' 2" as well. I weigh over 240lbs. The thing goes over 60mph and I got about 80 mpg. It is a great ride. On the down side it uses a carburetor instead of fuel injection and it doesn't have a glove box up front. I know, I know, consider the price. On the upside it has both front and back disc brakes. The suspension is fantastic. I quickly learned I didn't have to worry about riding over bumps. The machine rides great. It is a model of utility and functional efficiency. You just twist and go. It couldn't be easier. Motorcycles have more cultural cache, but motorcyclists envy the storage capabilities of a scooter: both under the seat and on the back. If you have additional storage needs I suppose you can get a scoot boot (http://www.scootboot.com/). When the weather is good there is just nothing more fun to ride. My understanding is that Honda perfected the engines and overall architecture for scooters in the late sixties and early seventies - and basically most every scooter engine/drive train is a clone of Honda's basic architecture. As a result, fairly decent quality is fairly ubiquitous amongst most manufacturers who have any amount of good will invested in their brand name. Certainly this scooter so far appears to be solid. My big complaint is in the documentation that came with the bike. It was almost worthless. The oil change information listed three different kinds of oil. The pounds per square inch they call for in the manual for changing the oil was way too high. These are basic things they should get correct. It renders the whole manual as untrustworthy. Documentation aside, the machine itself is as sound as a pound. It is hard to imagine paying less and getting more. It is easy to imagine paying more and getting much less. What a deal! LOL, no the sale was completely legal- they still have the promotion going in Tucson. You saved about $900. I was basing my statement on MSRP where a Zuma is $3100 and a Matrix undercuts it by $700. Heck I'd buy two Matrixes for the price of one Zuma. You got one heck of a deal. it does seem to me that the E-ton scooters are the Rodney Dangerfield of the scooter world, as they don't get no respect! E-ton is actually a well-known Taiwanese company (the parent company is Jai-Ee)that makes ATV's, scooters, and parts for many brands of cars. 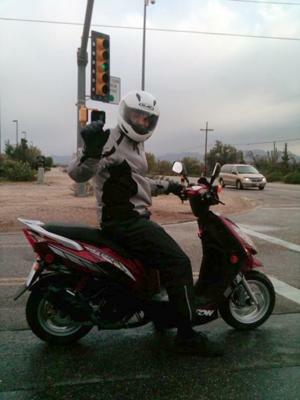 I bought mine at Ride Now in Tucson for $1500 new, which was 2.5 times less than a 125 cc Zuma. The E-ton has more leg/knee room, has better brakes, is more powerful and faster, and according to the dealer's mechanics, just as reliable as the Yamahas, Suzukis and Hondas they sell. It has nice features such as both a center stand and a kick stand, excellent headlights, and larger size wheels than many scooters in its class. It is also important to have a dealer nearby who will do all the servicing and repairs- I did pay for an extended warranty just in case. I also just bought a detachable rear luggage box, which was on the expensive side for a fairly cheap plastic box, but which fits well, and can be removed when I put the scooter in my community bike shed. (the shed isn't long enough for the scooter with the box). At 1200 miles with no problems, I would say that this scooter deserves a lot more recognition than it gets, especially for the price! This little known scooter has all the specs and is built for speed. Plus it's built in Taiwan and its MSRP is less than a Chinese built Yamaha Vino or Zuma which are only 125s and not as fast. You're right about what a great scooter it is and, while its parent company is more interested in selling ATVs, hopefully one day they'll get with the program and start pushing their scooter line.